On Tuesday morning near Swainsboro, a crowd will gather at Ohoopee Dunes Wildlife Management Area to celebrate the completion of educational and recreational improvements at the WMA, features such as an interpretive trail and small-craft boat ramp. The public is welcomed, and short tours will follow the ceremony at the McLeod Bridge Tract (details). But if you can’t attend, here are three reasons you should visit Ohoopee Dunes. Soon. 2. The new 1.9-mile trail offers an easy and enlightening hike, looping through habitats varying from xeric dunes to pocosin wetlands. Signage designed to fit the area's stark nature explains the surroundings; a sandhills pond, lichens and spikemoss, the role of fire in these natural systems, a rosemary bald, “cat-faced” pines that harken to the turpentine industry, and more. A trail spur leads to the floodplain. 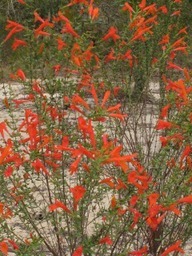 “It’s all of the different communities that are part of the Ohoopee Dunes,” said Dr. Mincy Moffett Jr., a botanist with DNR’s Nongame Conservation Section. The WMA is made up of three tracts on the upper Little Ohoopee River. The DNR also cooperates in managing an adjacent tract owned by The Nature Conservancy and another nearby owned by the U.S. Fish and Wildlife Service. The five tracts make up a nearly 3,000-acre conservation area. Like to fish? When the water level is right, fishing can be good on the Little Ohoopee for everything from redbreast sunfish to largemouth bass and pickerel. The new boat ramp on the Hall’s Bridge Tract is sized for johnboats, canoes and other small crafts. Efforts also continue to create a canoe trail section on the river stretching from the WMA’s middle tract at Ga. 80 to the Hall’s Bridge Tract. Most folks enjoy having wildlife living just outside their backdoor. But that hasn’t always been the case. In times past, people often either took their wildlife neighbors for granted or honestly believed that many of them were imbued with frightening magical powers. Worse yet, some thought they were cavorting with witches and ghosts. Many of these superstitions and myths have been handed down for generations and linger on to this day. This is especially true of a handful of animals that are doomed to be forever linked to Halloween. Here is a small collection of some of the bizarre myths and superstitions that concern some of our most familiar backyard residents … from owls to crows and spiders to snails. Read the rest of Terry’s column for an amazing look at how owls and other common wildlife used to cast a shadow of fear, particularly at this time of year. 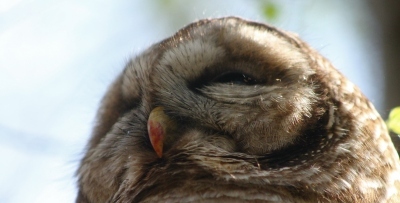 Listen to the calls of a great-horned owl, a barred owl and an eastern screech owl. 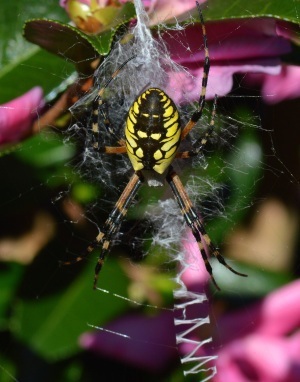 Crawly, not creepy: Learn about other “spooky” creatures such as grass spiders and copperhead snakes on the “Talking Nature Tuesday” segments with Charlie Elliott Wildlife Center’s Berkeley Boone. Here's the full album of videos. Thanks to a financial boost from DNR’s $1,000 Teaching Conservation grant, a Savannah science teacher will see his vision of an outdoor bog classroom come to life. Bill Eswine, a science specialist at Savannah Country Day School, was recently awarded the grant for his “Bog Diversity – An Outdoor Classroom” project, which will turn a large drainage ditch on the school campus into a bog habitat where students can learn about wetland wildlife. "Since we already had bullfrogs, leopard frogs and a lot of native plant species in that area, we thought it would be great if we could turn it into a bog – a site that would be an outdoor classroom,” said Eswine, who has directed a coastal ecology summer camp in the Savannah area since 1982. The grant, which has been met with a matching private donation, is provided by The Environmental Resources Network, or TERN, friends group of the Nongame Conservation Section. The section awards the grant annually to a third- through fifth-grade public or private school teacher in Georgia who demonstrates exceptional energy and innovation in teaching life sciences. Although the ditch may not look like much now, Eswine says the future site will allow his students to observe the diverse wildlife in a bog habitat, as well as study hydrology and the potential effects of pollution, climate change and other threats to natural bogs, a fragile and often-overlooked ecosystem. 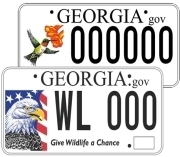 From the editor: Many of you know that Georgia’s eagle and hummingbird license plates provide more than half of the funds raised to conserve nongame wildlife. And that the DNR Nongame Conservation Section receives no state funding for our mission to preserve and restore nongame animals, plants and their habitats. But do you know what these efforts look like; in short, what wildlife tags do? Starting in this issue, we'll provide a series of snapshots that answer that question. If you have questions or comments, please email me. White-nose syndrome has killed bats by the millions, and Georgia’s bats aren’t going unscathed. The disease first reported in New York in 2006-2007 turned up here in 2013. The following winter, DNR surveys documented a 36-percent decline in known bat hibernacula in north Georgia. Bat biologist Trina Morris of the Nongame Conservation Section spent last weekend working the TAG Fall Cave-in, an annual event that draws cavers from Georgia, Alabama and Tennessee to Lookout Mountain. Her goal: Continue talking with cavers, cave owners and conservation groups to raise awareness about limiting winter trips into caves and following decontamination protocols for disinfecting clothes and gear, all part of DNR’s white-nose response plan. And this winter, Morris will return to the caves to again monitor the disease's devastating impact. To those who took part in the wildlife plates survey in the Sept. 29 issue. We’ve picked an eagle tag winner for this round, but stay tuned: We plan to give away another eagle plate later this fall! A “new” right whale calf has been documented off Cape Cod, Massachusetts. In May, researchers conducting an aerial survey spotted the North Atlantic right whale calf with an adult female that had not been seen with young earlier that winter in the Southeast, the species’ central calving grounds. The addition bumps the year’s calf total to 11. While still only about half the annual average (“Slow year for right whales,” April 8), the find is a morale-booster for scientists monitoring the highly imperiled whales. It’s not known where or when the calf was born. But the mother, nicknamed “Baldy,” was first seen with a calf in April 1974, meaning she’s probably at least 50 years old. This is her ninth known calf. While North Atlantic right whales will be arriving off Georgia’s coast by December, the Right Whale Festival in Jacksonville Beach, Fla., on Nov. 15 will kick off the calving season. The free event includes a beach cleanup, runs, music, kids’ activities and vendors, all geared to raising awareness about right whales and the threats they face, such as ship strikes and entanglement in commercial fishing gear. Twenty-seven federally protected species are due “five-year reviews” from the U.S. 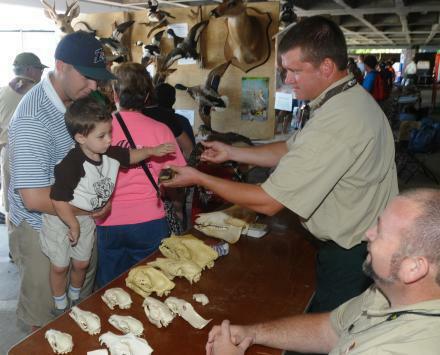 Fish and Wildlife Service to make sure their classifications under the Endangered Species Act are correct. Species found in Georgia include the endangered reticulated flatwoods salamander and southern acornshell, triangular kidneyshell, Coosa moccasinshell, southern pigtoe mussels, and the threatened frosted flatwoods salamander and Alabama moccasinshell and fine-lined pocketbook mussels. Georgia landowners will only have to sign up once for Natural Resources Conservation Service’s Environmental Quality Incentives Program and special conservation options such as Working Lands for Wildlife and the Longleaf Pine Initiative. The simplified application is aimed at making it easier for constituents to understand and participate in agency programs. The deadline to apply is Dec. 19. Florida’s loggerhead sea turtle nest totals remained high this summer and leatherback turtle nesting reached a new record for the Sunshine State. Though nest counts for loggerheads, the Southeast’s primary nesting sea turtle, vary annually, the overall trend in Florida, as in Georgia, is positive, according to the Florida Fish and Wildlife Conservation Commission. Names in the news: The South Atlantic Fishery Management Council Ranger has named DNR Ranger 1st Class David Brady its 2013 Law Enforcement Officer of the Year. Brady, who often patrols offshore as captain of the Law Enforcement Division’s SAFE vessel and a Contender patrol boat, led or took part in five federal fisheries cases referred to NOAA Fisheries the previous year. A new book by Ron Lance, "Haws: A guide to hawthorns of the southeastern United States," provides a detailed reference to the 62 hawthorn species and 144 subspecific taxa and hybrids known to occur in the region. Lance, a longtime naturalist, is a biologist and land manager with North American Land Trust. Oct. 28 – Land Manager’s Lunch: The Safe Harbor Program and Southern Quail Lands, Tall Timbers Research Station and Land Conservancy, Tallahassee, Fla. Register by Oct. 24. Lisa Baggett, (850) 893-4153 (ext. 241). (+video) "Videos hint at why tree bats may die at wind turbines," ScienceNews (citing study in the Proceedings of the National Academy of Sciences). the Georgia Natural Resources Foundation. The 2015 CoastFest is set for Oct. 3.